This chapter focusses on the necessary platform components like technology, leadership, talent and skills, delivery, trust, marketing, ecosystem, and business models required to support the capabilities of digital business innovations. The multidimensional platform organization and management is discussed. ‘Digitalization’ can be defined as “the use of digital technologies to change a business model and provide new revenue and value-producing opportunities; it is the process of moving to a digital business.” (Gartner, 2017). Today the adoption of digital innovation technologies redefines e-Commerce and e-Business. E- commerce – the interaction (buying and selling) among businesses and people conducted electronically on the Internet – is transformed in digital commerce – the interaction (buying and selling) among businesses, people and things for products and/or services via digital channels that results in a transaction of value to the customer. Customer value is based on a combination of factors such as a great experience, low price, timeliness, ease of use, policies, etc. Jorge Lopez (2014) explains the transition from e-business to digital business as ‘presence and integration of things, connected and intelligent, with people and business’. An interconnection of such kind requires a network that brings everything together and a cloud infrastructure providing all services necessary for coping with every demand of today’s business agility (Blaschke et al., 2017a.b). Digital business (see Figure 1) is a creation of new business designs by blurring the boundaries between the digital world and the physical one due to the convergence of people, businesses and things. 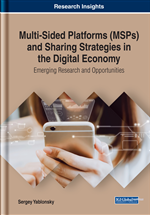 It promises an unprecedented convergence of a) people, b) businesses and c) things that changes existing platform business models and creates new revenue opportunities and platform designs (Lopez, 2014, 2017; Cearley et. al, 2017; Yablonsky, 2016, 2017). In digital business, business and technology are inextricable. To model a business, managers must understand what is needed for a business to achieve its goals, and how these goals translate into actionable strategy. For example, turning products into digitalized services that generate a steady revenue stream implies significant changes within all the other components. A digital business requires much more than technology (for example, leadership, talent, skills and new business models). To architect a digital business platform, organizations must lead their business to take a business-driven, outside-in approach. Digital business platforms empower flexible and dynamic digital business. Unlike a traditional business, with a clear inside and outside, a platform provides business with a foundation where resources can come together in different combinations - to create value. Some resources may be inside, permanently owned by the company; some may be shared; and some can come from an outside ecosystem. The value comes largely from dynamic connection of those resources and the actors, and the network effects between them. Platform design facilitates matches among providers and consumers (“users”) or, in other words, a creation or exchange of goods, services and social currency, so that all participants can capture value. Platforms offer unique opportunities to engage members of a business ecosystem to exchange value (Blosch and Burton, 2016). However, they require an entirely new approach to strategy, management and architecture. The answers to the question are not limited to digital business platform technology decisions, but also include businesses, markets, economics, partners, customers, human capital, processes, information and technologies. Digital platform disruption is a process of changing multi-sided markets through digital capabilities, channels and assets. Digital business innovation forms disruptive platform effects. To manage digital platform business models and multi-layered platform business ecosystems, companies are creating a digital business platform stack to share critical assets. The variance in company’s digital business performance is a function of differences in the platform resources and capabilities of competing companies. Definition 1 (Burton and Basiliere, 2016).